The sun is currently in Aries (March 20th - April 19th). If your sun sign is not Aries, these stones are still useful. The zodiac energy of each sign surrounds all of us based on the time of the year. The energies of Aries are at work now. Aries is the first sign of the zodiac. It coincides with the beginning of Spring when new life emerges. Aries gives us opportunities for fresh starts and new beginnings. It is the first sign in the cycle and Aries also wants to be first in everything else: first in line, first in competition. The fire energy of Aries is driven to succeed. It is aggressive energy but in a good way: persistent, not careless like Sagittarius, another fire sign. Aries is excellent for getting stuff done. We enter Aries as we leave Pisces, which has given us time to relax and reflect, helps us release the things we don't need, and gets us thinking about where we want to go from here. Now you should be ready to get going, Aries helps you get moving in this direction. For your convenience this post also comes in video form. Enjoy! The energy of Aries is almost blind due to the tunnel vision focus. Amethyst can help provide spiritual guidance so you can be sure your drive is directed toward your goals. The fiery nature of Aries energy craves the grounding earth energy of stones like Apache Tears. Meditate with Apache Tears to balance your root chakra and provide a stable base. Be careful with watery stones as they can put out the fire of Aries. Aquamarine is a gentle stone that can calm the wildness of the ram. Allow it to help you communicate your desires and goals and help you achieve them. Aventurine, especially Green Aventurine, is an earthy stone that encourages growth and abundance. Paired with the drive of Aries energy, success is just ahead. Additionally, Aventurine is a stone which opens the mind while providing a stable base, which Aries energy needs in order for the focus to help you achieve your goals. Another grounding, earthy stone, Bloodstone is associated with Mars energy, the ruling planet of Aries. Use it to keep your goals stable so that the driving energy of Aries can work it's purpose. Carnelian is a fiery stone so may be useful if none of your planets are in Aries and you feel you need a boost of fire. It is a stone of creativity and physical vitality. Citrine can keep your emotions in balance while you ride out the fiery wave of Aries. It encourages abundances during a time of beginning again. Additionally, it can be used when cleansing any of your chakras. So use it to start this astrology cycle with perfectly balanced chakras. At times of new beginnings, we may feel the need to find hope. Emerald provides hope, as well as prosperity, during your fresh start. Fire Agate, as it's name suggests, is a stone full of fire energy, so use it cautiously during this time of wild fire energy. It is included in this list for those of you who don't have strong connections to fiery signs, especially Aries. It also encourages spiritual perfection during a time of year we may be blind to our spiritual self. Unakite combines air and earth which can balance the fire of Aries energy. We have to be careful when using water crystals, because they can put the fire out. Air enhances the fire, and gives it room to breathe. Earth give the fire fuel and provides a steady base for it to burn. Blue Tigers Eye has that earthy energy that goes well with fire. Aries is almost blind because it is so focused. This energy can be too much because there is no space for reflection. Blue Tigers Eye opens the Third Eye giving you an alternative perspective. 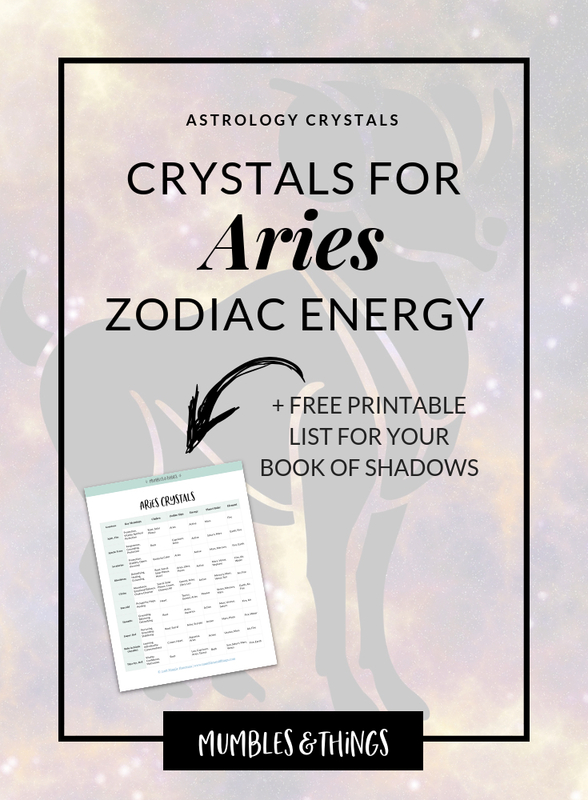 Want my list of Aries crystals? Click the button below to request your list to be sent to your inbox. This list includes the top 10 crystals associated with the zodiac sign Aries, plus, the three key uses, primary chakras, polar energy, planetary ruler and element correspondence.